Double Eagle is a ski-in-ski-out townhome development in Upper Deer Valley located on 7900 E Royal Street. Double Eagle townhomes are in six clusters of three townhomes per building which share one or two common walls. The townhomes were built in 1994/1995 and are three to four bedrooms with three to six bathrooms. The square footage ranges from 2,760 to 3,400 for most condos. One Double Eagle townhome is exceptionally large with six bedrooms, nine bathrooms, and is 6,472 square feet. Double Eagle can be a rarity and don not come up for sale often. If this page is not showing properties below there are currently none for sale. 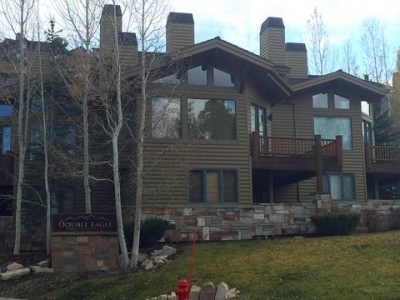 You may choose to view all the condos for sale in Upper Deer Valley.